"This is where the law stops and I start!" Thank you for reading the review for one of the all-time Comeuppance fan favorites! Cobra is awesome for so many reasons and the standard by which all other like-minded movies are judged. Cobra is a classic 80's film and everything about this movie is a recipe for success. 1. First, Sly does a voiceover consisting of lines like: "In America there's a burglary every 11 seconds, an armed robbery every 65 seconds, a violent crime every 25 seconds, A murder every 24 minutes, and 250 rapes a day." This was clearly added after the fact to pad out the running time. That being said, I'm glad the movie ran short because this opening sequence is both hilarious and sets the mood perfectly. And it's downright informative! Isn't that why you watch films like this? 2. 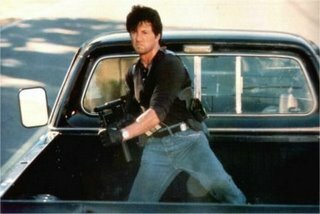 Next, start with a "Cop on the Edge" name like Cobra.... but with a trademarked Stallone twist his first name is Marion! He also cuts pizza with scissors, among other quirky actions such as putting his daily newspaper under his grill for safe keeping. 3. The first scene has Marion blowing away a robber in a supermarket. The one-liner is: "I don't shop here!" Genius! Intermission! Can you feel the heat? 4. The bad guy must have no lines (until the end), and no motive for killing anybody, but does it anyway. 5. There are no other stars in Stallone's film and he casts his previous wife Brigitte Nielsen as his love interest. 6. The chase scene consists of Cobra shooting bikers for 20 minutes! The infamous "orange grove chase" is padded out so ridiculously long it's laugh-out-loud funny. It's like an old-school video game where bad guys that are all dressed alike and look alike just keep coming and coming endlessly. Do these people honestly believe they can kill COBRA? Come on! 7. Also, Cobra's car is awesome. You have to see it to believe it. 8. Cobra contains every action movie cliche yet devised by the human brain. But it's all delivered so perfectly, so beautifully, and with such style and energy by Stallone, you would have to have a heart of stone not to love it. 9. Last but not least, we have to mention the soundtrack. I own it on CD. You should too, if you don't already. The theme of the movie is "The Voice Of American Sons" by John Cafferty. It makes no sense at all during the course of the film. Cobra doesn't even have a son...he just has beard stubble and shoots people. 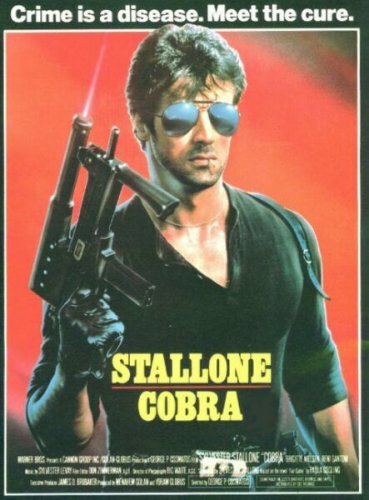 In the end, if you have an attitude problem ("just a little one"), you need to own the DVD of Cobra! I just watched this again for the blog, and I gotta say, I think I like it better now than I did as a kid. And great mention of the soundtrack-- though I think I might have liked something a little more rockin' for the end other than John Cafferty-- not that I don't love John Cafferty. Great stuff! Thanks! Happy you love it too. Cobra is a classic. "I don't shop here!" Thanks robotGEEK! There are so many great quotes and scenes! an action flick AND a slasher thriller, what more could I ask for the 80s?! Totally agree. It is the perfect combo! I always like Cobra I could see what would of happened if Stallone starred in Beverly Hills Cop it would of been Cobra. That would have been interesting...Happy he made Cobra though. A Stallone classic. One of the best movies ever made. Excellent review! The soundtrack is truly awesome. Brilliant songs by John Cafferty, Jean Beauvoir and Robert Tepper. Thanks! Cobra is such a great movie. One of Sly's best. The soundtrack is amazing...Robert Tepper's song rocks. I highly recommend Robert Tepper's 1986 album No Easy Way Out, which features the Cobra song Angel Of The City. Will have to buy that album!